A memorial stone cross erected by Cyngen ap Cadell (Concenn), the last native King of Powys, in the memory of his great grandfather Eliseg, on which the ancestry of his family is recited. 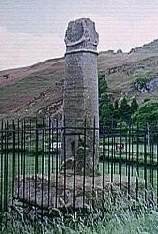 The remnants of the "pillar of Eliseg" stand to this day in the vale of Llangollen, near Valle Crucis abbey. The cross is now missing and the inscription largely illegible, but in 1696 Edward Lhuyd (antiquarian, lexiographer and Celtic scholar) is said to have examined and copied what he could. & . However it appears that it was the great antiquary Mr Robert Vaughan of Hengwrt who took the copy in 1662 and Edward Lhuyd transcribed it . The names of the ancestors of Concenn (Cyngen) are given in their local form, namely Cattell (Cadell), Brochmail (Brochfael/Brochwel), Eliseg (Elisedd), Guvillauc (Gweliawg), Eli (Beli), Eliud (Eiludd), Cincen (Cynan), Cinen (Cyngen) and Guorthigirn (Vortigern). This genealogy raises a small confusion in the form of "Britu", the son of "Guorthigirn" (Vortigern Vorteneu/Gwrtheneu), who isn't normally listed as a son. A quite neat and probably correct postulation by M. Baker 2002 has both using the term "Vortigern" to mean "overlord" (ie there were two Vortigerns: Vorteneu and Britu- see Vortigern.html#overlord). 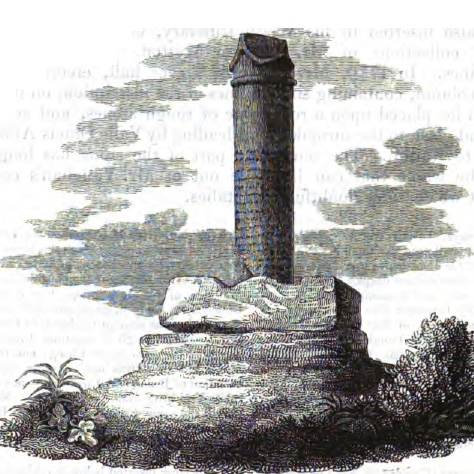 Apparently when the original mound (on which the pillar was re-erected in 1779) was opened, it was found to contain the remains of not Eliseg as expected, but (according to an expert) his ancestor Cadel Ddyrnllug, King of Powys, grandfather of Brochwel Ysgithrog .